St. Clair Dental provide oral healthcare to all members of the family. Their patients enjoy their welcoming and friendly environment. They stay up-to-date with the latest technology and provide ultimate comfort when attending the dental appointments. Dr. Karl started St. Clair Dental and dedicated himself to learn as much as he can while being the best dentist he could be. She continuously enrolls in educational classes so she can expand her knowledge. She cares for her patients and will continue to provide them an excellent service. This dentist website was designed for Dr. Maureen Karl and depicts her wonderful dental practice. We have included specialty content and a contact form. There is a website editor that she may use as well as website support. Also, a dental marketing program has been activated for this website. 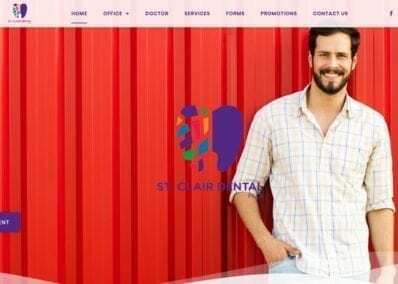 When a visitor arrives at the St. Clair Dental website they’re greeted with a slideshow of beautiful images showing engaging smiles and cycling between some striking backgrounds. The presence of a ‘Book an Appointment’ button, hamburger menu at the top of the screen, and two links to their primary social media channels make the first page both useful and engaging. Three colors play major roles throughout this site, being purple and white. Throughout the site, purple lends its air of elegance and luxury to its appearance, while the clean neutral color of white provides a wonderful contrast. • Contrast – Purple and white happen to contrast beautifully, each being equally capable of calling the viewers attention to important areas of the site as well as being good colors for text on the opposite color. St. Clair Dental is an excellent example of this. • Action Oriented – Throughout the website can be found a prominent purple Book an Appointment button, ensuring that the customer has immediate access when the mood to makes an appoint strike. The Hamburger menu at the top of the screen is equally well marked by purple on a white background. The site is designed with a relatively minimalist approach, spending most of its bandwidth on the opening slideshow. From there on out you are introduced to a very streamlined and beautiful site with easily readable text and clear navigational guides. • Space – The whole site carries an open, relaxed feel. Every element has sufficient space to present itself without being crowded, making the site pleasant to view and easy to read and navigate. • Navigation – The site is very image light, outside of the initial screen, instead relying on the striking white on purple text to provide information about the various services they provide. Navigation is also made simple by the hamburger menu located at the top of the screen. • Ease of Contact – The availability of contact information for the visitor is an important part of a sites ability to convert viewers to patients. With the Book an Appointment button being prevalent in the design of the site you’re never more than a click away from scheduling a visit. • Easy to Fill Out Forms – The forms on this site are very clear and easy to fill out, with just a few points of information required to get your message on its way. Visitors don’t like to spend a lot of time filling out forms, so short is better. This site demonstrates a clear, minimalist design for the end user that makes scheduling, getting information, and navigation throughout the site a breeze. This site is perfect for those looking for a lightweight site that’s easy to navigate and lets the content speak for itself.